As competitive as international long distance rates for Canada may be, Canadians needing to make international conference calls face a few problems. While conferencing with others in Canada and the United States is fairly straightforward, it becomes more difficult with participants in other countries. Because long distance costs between the United States and Canada are minimal, cost is rarely a concern for international conference calls between these two countries. Moreover, toll free phone numbers work across the US-Canada border. Costs vary based on the countries involved and their respective international calling rates. You can't necessarily give international participants your Canada toll free number, either. That's because Canada toll free numbers only work with callers in Canada and the United States. Using an international conference calling service with dial-in support for 150 access numbers around the world. Instead of giving callers your Ontario phone number and expecting them to absorb the potentially high cost of long distance, you can issue special international access numbers that route all participants into your international conference call. Each participant will be able to dial a local phone number (for example, callers in Hong Kong will dial a local Hong Kong phone number) or a toll free number unique to his or her countries. The calls will then be routed over a PSTN network into a global conference call. As the moderator of the international conference call, or a Canada Conference Call, you have the option of issuing local numbers or toll free numbers. If you opt for toll free numbers, you'll be charged accordingly based on individual calling rates for each country. Whether you need to hold a single international conference call or plan on holding them on a regular basis, you'll find our service to be an exceptional value. Before January 1, 2000, Canada's telecommunications market featured 58 telephone companies. The largest of those companies (British Columbia Telephone Company, Alberta Government Telephones, Saskatchewan Telecommunications, Manitoba Telecom Services, Bell Canada, The New Brunswick Telephone Company Limited, Maritime Telephone and Telegraph Company, Limited, The Island Telephone Company Limited, and Newfoundland Telephone Company Limited) were part of a national alliance known as Stentor Canadian Network Management. The remaining companies where known as independents. Together, these telephone companies, which were heavily regulated, provide local and long distance telephone services and cellular services (via affiliates). After December 31, 1999, the Stentor Alliance broke up, and consolidation began, with Bell and TELUS being the primary players. Ownership varies with both public- and private-owned telecom companies. Most wireless carriers are affiliates of Bell and TELUS. Long distance rates within Canada and into the United States are extremely competitive. For example, Bell currently offers an unlimited long distance calling plan for Canada and USA for about $10 per month as part of its TV, Internet, and Phone bundles. It also offers a low-cost International long distance add-on as well as a "Canada Direct" plan for making international calls from overseas. Canada, with its population of 34.8 million people, is a large country with abundant natural resources. With ties to the British crown, Canada is a self-governing member state of the Commonwealth of Nations. Member states share a common language, history, culture, and rule of law as well as the values of democracy and human rights. Canada shares the world's longest, unfortified border with the United States. Though English and French are Canada's official languages, its diverse population also speaks Punjabi, Italian, Spanish, German, Tagalog, Cantonese, Arabic, and other languages. 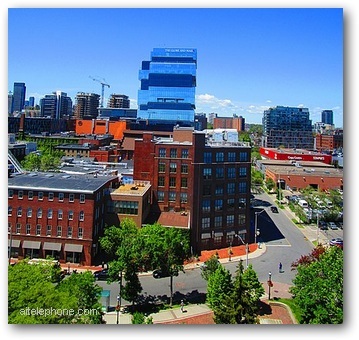 More than 80 percent of Canada's people live in urban areas. Major population centers in Canada include: Toronto, Montreal, Vancouver, Calgary, Edmonton, and Ottawa. Canada has played a pivotal role in telecommunications. For example, did you know that the first trans-Atlantic radio transmission was received in Newfoundland? Or that Alexander Graham Bell developed his telephone concepts in Brantford, Ontario at his parents' home? 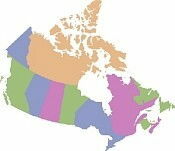 As of 2012, Canada had 18.01 million main line telephones in use as well as more than 26 million mobile cellular phones. The CIA World Factbook reports that Canada's telecommunications system consists of modern technology and excellent service. Its telecom system includes satellite communications, fiber optic networks, cellular telephony, national data networks, cable TV, and extensive Internet access. Canada has roughly 300 earth satellite stations in its domestic satellite system. It is connected to the United States and Europe via submarine cables and 7 satellite earth stations. Canada ranks high in terms of Internet hosts (14th in the world) and Internet usage (16th in the world). As of 2012, Canada had 8.74 million Internet hosts. In 2009, it had 26.96 million Internet users. Optionally the chairperson or attendee can use the web 'Connect' feature to trigger a callback to his/her phone to enter the Canada conference call. Your participants in Canada can access the conference call by dialing a Canadian Toll-Free or local number from any location in Canada. For instance, your office in Toronto can host a conference call with your customer located in the UK and new potential client in Japan, all on the same call. Canada International Conference Call Service Enables Conference Call Meetings With Attendees Located In Any Country.